Interestingly Facebook is generally regarded as a young person’s means of communication. 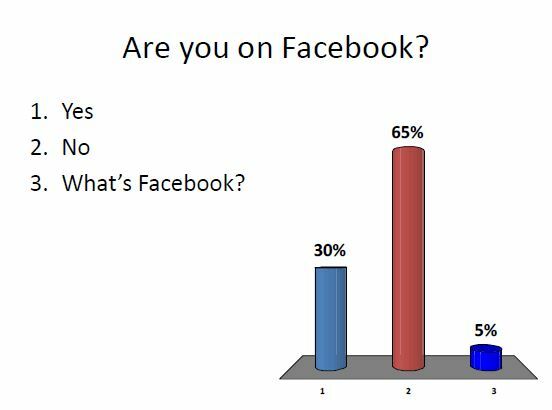 Perhaps surprisingly almost a third of the group are on Facebook. Although 80% of them are computer users, so it’s still the case that the majority do not use Facebook. Clearly some people use Facebook to stay in contact, particularly with grandchildren. But it also opens the book to a wider conversation which may not be on the same wavelength as the older generation. FOOTNOTE: It would be worth further exploring the benefits of Facebook for older people. It’s possible to have a “membership” group with limited access to outside friends. This entry was posted in GRUMBLESMILES TRUST and tagged "A Happiness Ladder", CAFE PROJECT. Bookmark the permalink.